Despite the fact that the Hoosiers haven’t played much baseball, a whole bunch has changed in the past week as RPI and B1G Ten predictions go. 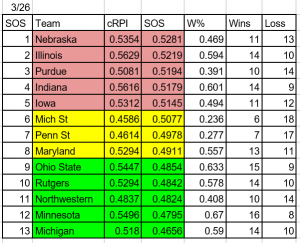 The biggest change was to the strength of schedule (SOS) predictions for the B1G Ten. I’m sticking with updating the predictions for now because there are not enough real games in conference to factor in (three teams have not even started conference play). I did adjust by removing a game for Indiana and Iowa and predicting their results as a 23 game season (not 24). Michigan’s sweep of Michigan State pushed the Spartans over a tipping point which caused their national ranks to plummet. This had the effect of dropping the SOS of teams that play Michigan State (including Minnesota, but not including #iubase). This puts Minnesota back on top just as the December prediction based on 2017 numbers did. I caution, however, as the results produced here are not as significant to me as how quickly they changed. This means that it is still early enough in the season for just a week’s worth of results to drastically change the national ranking models (ELO, ISR, RPI). Within a few weeks this should start to settle down. Also in a few weeks I will shift to calculating cRPI based on actual conference results, and not just national ranks. 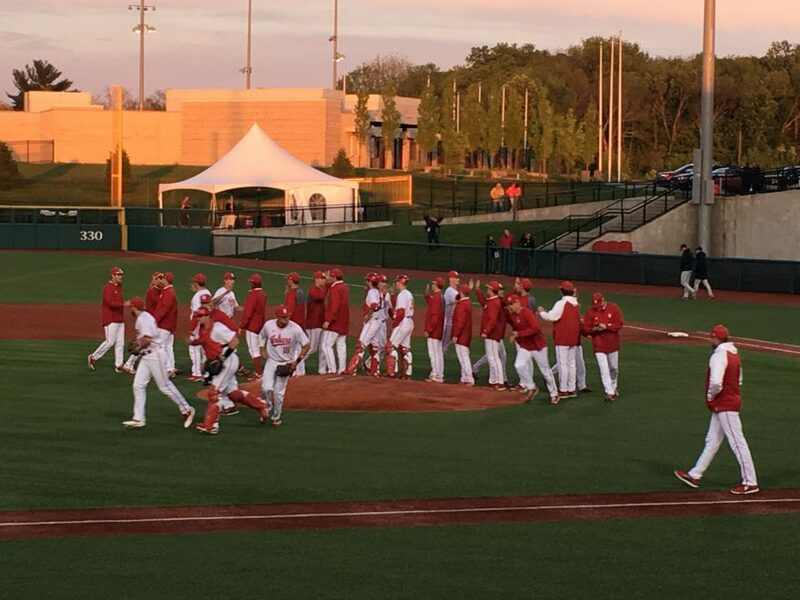 For the NCAA post season picture, my predictions as set before dropped #iubase from a final RPI rank of #11 to #22 with the cancelled games and the split with Iowa. Looking at Boyd’s World’s RPI Needs report (http://www.boydsworld.com/baseball/rpi/rpineeds.html) the Hoosiers are in need of a 26-6 regular season finish in order to get a top-16 national seed (and host a regional). This would require winning every weekend series, sweeping three of those, and only losing one more midweek. The midweeks include two games with Indiana State, Notre Dame and Ball State in the same week, #20 Louisville, and #6 Kentucky. This is by no means impossible, but it would be an impressive stretch with no almost no margin for error. As Boyd’s number are pretty close to mine, I’m assuming that he is applying real past and future opponent results into his model. The hope here is that the opponent win percentage slump over the past few weeks will turn around. For example San Diego (4 games vs IU) finally got turned around with a winning series in the WCC, but unfortunately did it against Pacific (3 games vs IU) so the RPI benefits were mostly negated. If both of those teams do well in the rest of WCC the impact to IU would be positively stronger. The point is that Boyd’s needs report is not set in stone and may shift dramatically based on other team’s results. 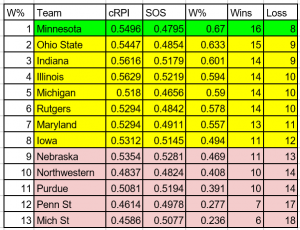 Now while national seed RPI looks a bit daunting, top-32 for a regional 2-seed looks very much in line for the Hoosiers with a needed finish of 21-11. This is a lower win percentage than the Hoosiers have to date. They could drop a single game in every weekend series and lose 3 midweeks, or offset a 1-2 series loss with a good team like Illinois with a sweep of team like Northwestern. These predictions end before the B1G Ten tournament. This is important because the path to hosting may be coming in-between 21 and 26 wins and going on to win the conference tournament. The advantage in that week is that the large group of ACC and SEC teams that are vying for hosts are likely to lose games in that week and an opportunity may appear for the Hoosiers to advance.